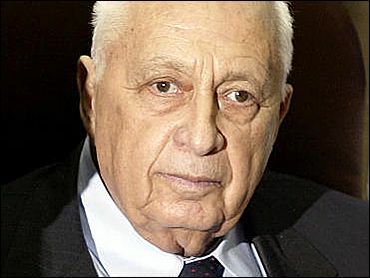 Israel's attorney general on Tuesday dropped a corruption case against Ariel Sharon, ending months of uncertainty over the prime minister's political future. The decision to drop the case also gives a boost to Sharon's plan for a unilateral Israeli withdrawal from the Gaza Strip, reports CBS News Correspondent Robert Berger. Attorney General Meni Mazuz told a news conference that he is not indicting Sharon on bribe-taking charges because of lack of evidence. Mazuz informed Sharon of the decision by phone before the news conference. The decision clears the way for Sharon to court the opposition Labor Party, which has said it would only consider joining the government if the prime minister is cleared of corruption allegations. Sharon needs Labor to restore the parliamentary majority he lost as a result of the dismissal or defection of Cabinet hardliners opposed to a Gaza withdrawal. Sharon wants to remove Israeli soldiers and settlers from Gaza by the end of 2005. At the center of the corruption case are suspicions that Israeli businessman David Appel paid Sharon's son Gilad hundreds of thousands of dollars to help push through a lucrative real estate deal in Greece, at a time when Sharon was foreign minister in 1999. In the end, the project did not go through. Appel has been indicted for allegedly paying bribes but under Israeli law, prosecutors must prove that the recipient of a bribe was aware of the improper payments. Sharon has denied wrongdoing. Mazuz said there was no solid evidence against Sharon. "The evidence in this case does not bring us anywhere close to a reasonable chance of conviction," he told the news conference. Even with the end of the investigation, Sharon's legal problems may not be over. Israeli prosecutors are also probing Sharon and his sons for allegedly receiving an illegal $1.5 million loan from a South African businessman. Sharon has denied any wrongdoing in the case. The opposition party Yahad said it plans to appeal Mazuz' decision to the Supreme Court. "A decision by Mazuz not to bring (Sharon) to trial cannot be the end of this," Yahad legislator Ran Cohen told Israel Radio. "It has to go to the court system to be examined at the highest level, by the Supreme Court, and only its decision will put an end to this affair." Meanwhile, Israel has begun construction on one of the most controversial sections of its security barrier in the West Bank, reports Berger, confiscating large tracts of disputed land in the West Bank. The barrier aims to keep Palestinian suicide bombers out of the country. The land confiscations are taking place in the area of the big Jewish settlement of Ariel. The U.S., which opposes the settlements, has warned Israel not to include Ariel within the barrier. Israel says it's leaving a hole in the fence in the Ariel area, with the option of closing it in the future. Israel also is considering building thousands more homes in West Bank settlements, in line with Prime Minister Ariel Sharon's plan to keep large chunks of the territory but give up the Gaza Strip, security officials said Tuesday. The Israeli daily Maariv reported Tuesday that Defense Minister Shaul Mofaz has asked the military to draw up plans within three months for building thousands of homes in three of the settlement blocs — Gush Etzion, Maale Adumim and Ariel. Mofaz met Monday with settler leaders in Gush Etzion, and security officials said he told them he would consider their request to authorize between 1,000 and 2,000 new homes in the area. Mofaz told settlers he would make a decision within three months, the officials said on condition of anonymity. Shaul Goldstein, the deputy head of the Yesha Council, the settlers' umbrella group, confirmed that he spoke to Mofaz about new building in settlements, but said no specific numbers were discussed. Maariv reported that new construction is also being considered in Maale Adumim and Ariel, the West Bank's two largest settlements. Israeli forces thwarted a car bomb attack Tuesday in the Gaza Strip. Troops opened fire at a jeep that aroused suspicion, and the vehicle, which was packed with explosives, blew up. The army said no one was hurt: The Palestinian bomber jumped out of the jeep and escaped. Earlier, an Israeli helicopter fired a missile at a car in the West Bank town of Nablus, killing three Palestinian militants. One was a local leader of Al Aksa Martyrs' Brigades, who Israel says was responsible for many shooting and bomb attacks.